It was dubbed the "trial of the century," and became a spectacle unlike any that had preceded it in television history. It polarized its audience and the nation, bringing racial tension and divisiveness to the forefront in ways unseen in decades. It unfolded as a real-life soap opera in front of the eyes of millions, in a story no screenwriter could hope to come up with and be believed. Rockingham and Bundy became fixtures in our daily lives, as no one who was old enough to watch television during the event could miss the continuing saga we witnessed, in this American Tragedy. For the African-American community, O.J. Simpson—"The Juice"—had been an icon, a man who escaped the ghettos to become a football legend. He broke every pro football record there was, won the Heisman trophy and, after his rise to the top of the athletic world, would remain a fixture in American households, as an actor, sports commentator, and corporate spokesman. Everyone knew OJ, so when the first news reports came in on June 12 1994, an event that would rivet the world had begun. When his estranged wife, Nicole Brown Simpson, and her friend, Ronald Goldman, were found murdered outside Nicole's residence at 825 Bundy, no one could have foreseen what would come next. From the televised, slow-motion chase of OJ's white Ford Bronco as he attempted to elude police, to his arrest and the subsequent trial—both in the courtroom and in the media—through his eventual acquittal, this was news on a scale never seen before. Adding to the uneasiness felt by having a major celebrity accused of murdering his ex-wife were the racial elements: a black man accused of killing two white people. Polls at the time indicated that the vast majority of the white population believed Simpson guilty, where an equal percentage of black people felt he was innocent. This procession would not only put Simpson on trial, but would evolve into a trial of the American justice system itself, with characters who could only come from real life, like the racist white cop, Mark Fuhrman, who finds the crucial evidence, "Kato" Kaelen, Simpson's boarder who heard the infamous "bump in the night," and the members of the scientific evidence team who displayed what appeared as gross incompetence, as their errors were brought to light. Even the judge couldn't escape controversy, as potential conflict of interest charges were raised, narrowly avoiding a mistrial. While the prosecution brought forward Marcia Clark and Chris Darden, on center stage was OJ's formidable defense, the so-called "dream team": Johnnie Cochran (Ving Rhames), Bob Shapiro (Ron Silver), F. Lee Bailey (Christopher Plummer) and Barry Scheck (Bruno Kirby). This is the story of that team and the trial, from a behind-the-scenes perspective: how it came together, the strategies they used, and the disagreements that turned the dream into a nightmare. For those who followed the case, this covers a lot of familiar ground. The collection of evidence, the inconsistencies of that evidence, and the personalities that turned this murder trial into a circus. To their credit, the producers did not try to cast many of the witnesses, including Mark Fuhrman; instead, they used the actual court video tape of their testimonies and cut it with live actors. Casting a film like this would have been extremely challenging, given the public's all-too-familiar knowledge of the real people portrayed. While some of the cast leave a bit to be desired, most pull it off rather well, with Ron Silver, Clyde Kusatsu and Bruno Kirby taking honors in my book. Plummer's makeup job blew his performance for me, and I felt the scripting of Ving Rames' Cochrane left a lot to be desired, though what he did with it was admirable. OJ is never seen portrayed in anything other than shadowed figures or behind the head shots, and I feel this was the weakest part of the whole film. While I would hardly classify this as a first-rate production, for those interested in the case, it does make an interesting backstory. The film does have its good points, and the intercutting of actors with the real court testimony was an accomplishment. The matching of the courtroom footage with the acting was great, though some of the process shots, particularly the acquittal footage, looks pretty low buck. What wasn't so great was the way they chose to incorporate actual TV footage, such as newscasts, which ended up stretching the image to fill the 1.85:1 frame, rather than windowboxed. This had me trying to figure out which aspect mode to be watching on TV at first. 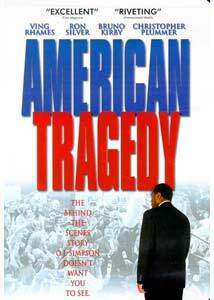 Technical and stylistic choices aside, American Tragedy does offer an interesting, though I suspect, highly fictional look inside the goings-on in one of America's biggest, real-life soap operas. Whether this was a gross miscarriage of justice, or an innocent man vindicated of wrongdoing, is still undecided for many. What we do know is that the case forever changed the way we look at the justice system, and the way the media became involved in the process. Image Transfer Review: American Tragedy is presented in anamorphic 1.85:1, though as noted above, some of the television footage used was presented without windowboxing, thereby stretching it horizontally. Colors and black levels are fine, and grain is not an issue. With the variety of sources used for this there is a natural variance in quality. Testimony shots, which we would have seen live through wall-mounted video cameras, is faithfully reproduced and cuts well with actual court footage. Audio Transfer Review: Audio is presented in stereo, and for the most part there is nothing to complain about. A bit of distortion here and there is the only real deficiency on this release. Extras Review: The second disc in the set contains two sections, with the Evidence Locker containing a number of stills galleries and two police tapes. The first section contains a collection of letters, including Simpson's hand written "suicide" note, and an eight-page letter from Nicole to OJ. Other court displays, including the bill-of-sale for the notorious gloves and an Armani shoe display used in the trial. A collection of nine crime scene photos cover the glove, the blood drops, the passageway behind Kaelen's residence, and of course the Bronco. An aerial view section has layouts of Bundy and Rockingham, with inset photos showing where evidence was gathered. A diagram of the Bronco is also included. Finally, there are a pair of L.A.P.D. videos. The first is the police video surveillance footage (12m:19s) used to determine the drive times between Rockingham and Bundy. Detective Van Adder drives to and from Simpson's home, and his progress is followed on an overlaid map. The second feature is a slide show (11m:31s) of police evidence photos from the crime scene and Simpson's estate. Some of these are quite explicit, showing Goldman's body at the scene and the blood on the walkways, so may not be suitable for more sensitive viewers. The second feature is a 1973 special showcasing OJ Simpson, the sports legend, in George Romero's documentary, Juice On The Loose, running 47m:46s. The film includes interview footage with Simpson, his family, teammates, coaches and notable celebrities like Howard Cossell, describing Simpson's place in football history. Also included is footage from the December 16, 1973 game between the Buffalo Bills and the New York Jets, when Simpson broke his last rushing record with 2003 yards in one season. Video quality shows its age, but this is an interesting juxtaposition to the events that would follow two decades later. Trimark shows some levity naming the discs O and J. The first disc opens with an animated 01m:30s nonskippable introduction. On October 3, 1995, the verdict of "not guilty" on two counts of homicide was delivered in the Orenthal James Simpson trial, over a year after jury selection began in September of 1994. This television movie looks at the team behind Simpson's defense: how it was put together, and how it almost fell apart. For those who can't get enough of this "trial of the century," this does provide some entertaining backstory, though many may find that it is nothing but a painful reminder of how the American justice system failed. Either way, after the spectacle of the trial and its following civil cases are long over, the fact that the killer of Nicole Simpson and Ronald Goldman is still at large is the true American Tragedy.